Guitariste US né Chester Burton Atkins, le 20 Juin 1924 à Lutrell (Tennessee). Chet Atkins est d'abord violoniste avant de se mettre à la guitare. Il débute à Nashville en 1946 et remarqué par RCA Records, devient musicien de studio. Nommé responsable des studios RCA de Nashville à partir de 1957, il contribuera à forger le Nashville Sound. Chet Atkins, roi du picking et du finger style, fut l'un des guitaristes les plus prolifiques et influents des années cinquante à nos jours. Il fut élu membre du Country Music Hall Of Fame en 1973. Chet est mort à Nashville d'un cancer le 30 Juin 2001. Once he arrived in Nashville, Atkins recorded eight tracks for the label, five of which featured the guitarist singing. 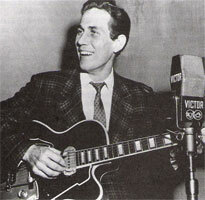 Impressed by his playing, Sholes made Atkins the studio guitarist for all of the RCA studio's Nashville sessions in 1949. The following year, Mother Maybelle and the Carter Sisters hired him as a regular on the Grand Ole Opry, making his place in Nashville's musical community secure. While he worked for RCA, he played on many hit records and helped fashion the Nashville sound. RCA appreciated his work and made him a consultant to the company's Nashville division in 1953. That year, the label began to issue a number of instrumental albums that showcased Atkins' considerable talents. Two years later, he scored his first hit with a version of "Mr. Sandman"; it was followed by "Silver Bell," a duo with Hank Snow. 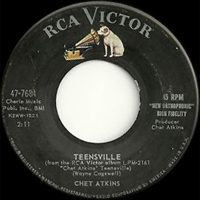 By the late '50s, Atkins was known throughout the music industry as a first-rate player. Not only did his records sell well, he designed guitars for Gibson and Gretsch; the popularity of these models continues to the present day. 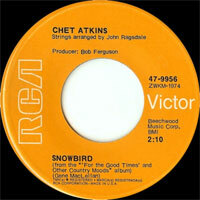 Atkins continued to record for RCA throughout the '70s, although he was creatively stifled by the label by the end of the decade. The guitarist wanted to record a jazz album, but he was met with resistance by the label. In 1982, he left the label and signed with Columbia, releasing his first album for the label, Work It Out With Chet Atkins, in 1983. 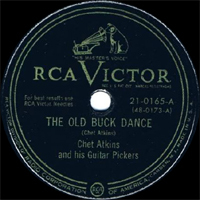 During his time at Columbia, Atkins departed from his traditional country roots, demonstrating that he was a bold and tasteful jazz guitarist as well. He did return to country on occasion, particularly on duo albums with Mark Knopfler and Jerry Reed, but by and large, Atkins' Columbia records demonstrated a more adventurous guitarist than was previously captured on his RCA albums. 11/1954 78 t. RCA VICTOR 20-5995 (US) . 06/1956 SP RCA VICTOR 47-6558 (US) . 1962 SP 33 t. RCA VICTOR VP-2-2668 (US) . 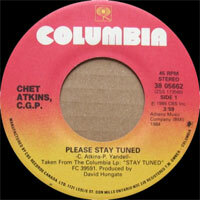 09/1972 SP RCA VICTOR 74-0794 (US) . Theme From A Summer Place / ? 05/1975 SP RCA VICTOR PB 10362 (US) . Night Atlanta Burned / ? 12/1976 SP RCA VICTOR PB 10864 (US) . Terry On The Turnpike / ? 06/1986 SP COLUMBIA 38-06165 (US) . Official Beach Music / ? CD 5 : My Funny Valentine / I Know That You Know / Zing Went The Strings Of My Heart / I'm Forever Blowing Bubbles / Country Style / Estrellita / Little Old Lady / Let It Be Me / Meet Mister Callaghan / Santa Lucia / Armen's Theme / Theme From Picnic / The Three Bells / The Theme From Limelight / Greensleeves / Theme From A Dream / Jitterbug Waltz / Peek A Boo Moon / Backwoods / Walkin' The Strings / Beautiful Brown Eyes / Tennessee Waltz / Birmingham Jail / The Prisoner's Song / In The Good Old Summertime / Titanic / Cold Cold Heart / John Henry / Goodnight Irene / Music! Music! Music!